“When tragedies strike, heroes rise to meet the challenge: the first responders seen sprinting toward the blast site, the runners who changed course to run to local hospitals to donate blood, and the fine citizens of Boston who at once opened their homes to marathoners in need of a place to stay. When we come together, we cannot be brought down." March 2013 is a snowy month. The past winter was so mild, and Mother Nature finally decided to dump some snow to New England. 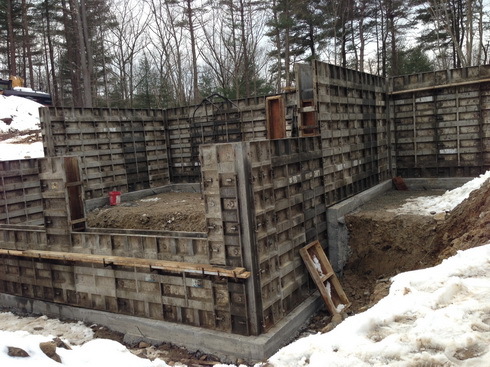 And it all happened in March; that efficiently slowed down the construction of foundation of the house. 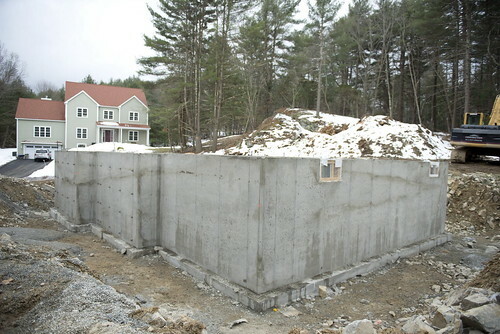 Foundation is the base of a house. The cartoon above shows its general structure. 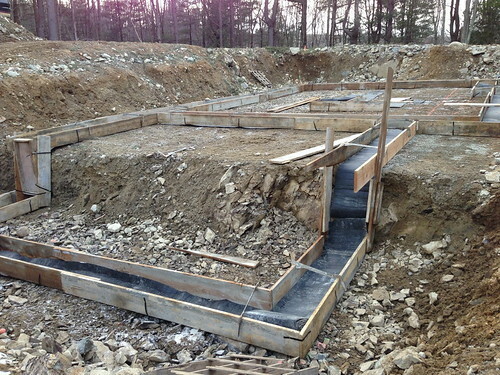 The first step of foundation is digging the trench for footing. In our case, we have a basement and it sits on a big ledge. 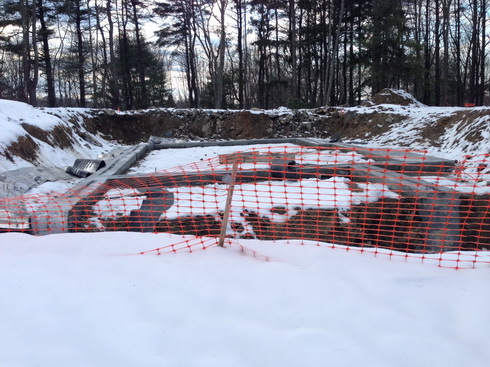 Our builders actually blasted the stone underground and dig out foundation hole. It is hard to see with dirty removed but you can still see some stone from blasting in above photo. 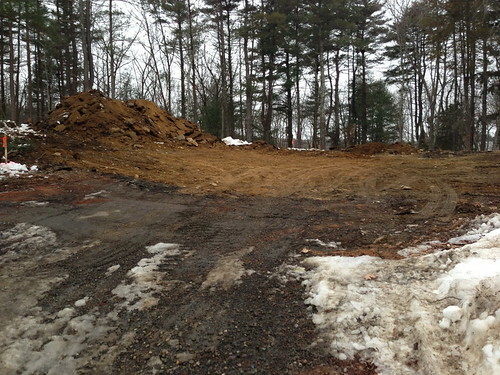 The photo below shows the footing has been in place. Then we got a good size of snow. Building a house is truly a tough job. Our builder has been working very hard. 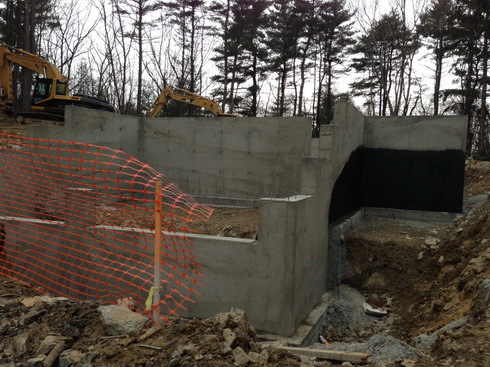 The wall was installed Mar 25th. Finally, after much delay due to whether. The basement is finally ready. 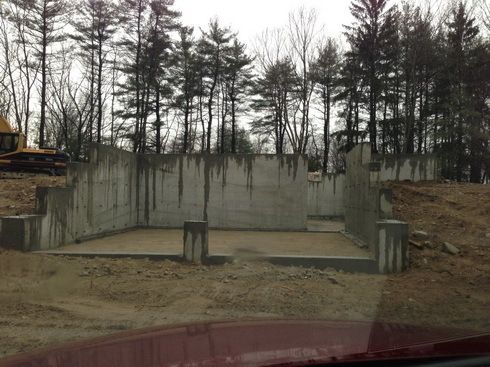 In case you are wondering, the last photo is viewing the future garage. In today's real estate market, builder tends to sell large sqft house. From the foundation process, you may understand now. 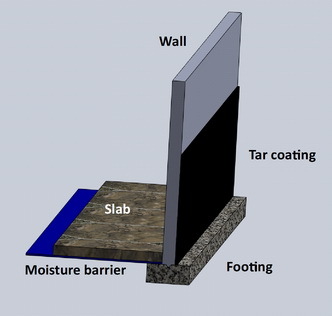 The cost of both material and labor going to foundation is significant. However, a slight increased size of foundation, e.g. a few feet in width and length, builder can easily put several hundred sqft to house without incurring much foundation cost. So in general, a large house is cost effective for builder to make more profit. Do you know how much extra to build 12ft or 13ft ceiling house compared to standard 8-9ft ceiling house? Thank you very much! What I learned from the builder is if the ceiling is increased from 9ft to 10ft, the cost may go up 10%. For further increase, the structure needs to be reengineered and the cost is hard to estimate. Building such a tall ceiling house in residential housing may make it hard to sell in the future. thank you! We have been looking at victorian houses that were built in 18XX. They all have enormous ceilings, generally 12 ft. And they seem to be very popular as well. They are sold very fast. I dont like 8ft ceiling houses built in the 50s-70s. Tall people feel very clausphobic in these houses. Thanks for sharing your precious information here. 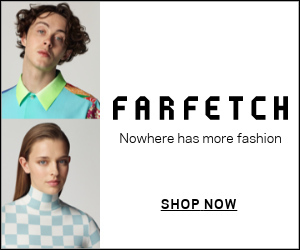 I like your blog (both fashion and living). I think we're in the situation you might come across one or two years ago about hunting the decent house without sacrificing the location, but it's not easy in today's market as you know:) Looking at your blog, which inspired me to think of new construction as one option. May I know which town is this? I was mostly looking at Newton or Lexington. And does your builder have any online detail info (like cost) to share? Many thanks! We are located in Sharon. I think the land at Newton or Lexington is more scarce and you may find teardown is a more potential option. Building a new home is cheaper last year since many builders just sit around and need job. The market turned around and builder began to escalate their price. Our builder doesn't have any price online but if you are interested, you can call and consult them. Let me know and I will provide a contact. can you share your builder's contact information to me? I am in newton. I consider tear down and re-build the house. Thanks.